make it perfect: .Downtown Boy GIVEAWAY!. I have a copy of my new Downtown Boy pattern to give away, easy peasy to enter - just leave a comment on this post. If you want an extra entry then mention this giveaway on YOUR blog. Make sure you tell me you have done this though (leave a comment or email me) so that I know to give you two entries. Giveaway comments will close on Thursday 16th July (Australian time). Pick me! With 3 littler boys I could make good use of this pattern! I'll blog about the giveaway as well. Just the pattern I was looking for. I have 9 nephews and one of the little one's birthdays is coming up very soon. Great design Toni. Please count me in! I'm not entering because it looks too hard for me. But when I get a second hand sewing machine for Christmas (hint hint) Fil and I will definitely try to make something using a pattern. I was so excited the other day to receive your email announcing this pattern as I have both a little boy and big boy, the uptown jacket (girls) is totally divine and Miss Jaida seems to be getting spoiled with your pattern range (flipsy, pinny etc.) that it would be a nice change to spoil and pamper Caleb and Jaxon with their own jackets too!!! I've had a new sewing machine for a couple of months now and all I've used it for is to sew up the dogs bed which he chewed! I'd love a groovy downtown jacket project... Too cool for school!! Yay! A cool boy jacket- Love it! Count me in please. Even though I only have a little girl, this jacket would be perfect for her. A girl cant have too many jackets! I have also mentioned this on my blog. Woohoo! One for the boys. Both girl and boy version of your jackets are lovely and this is definately on my "to do" list now! My boys tend to miss out! please count me in twice (blogged) :) i hope i win! All my sewing buddies are raving about the Uptown Girl Jacket. How cool would it be to win the Downtown Boy Jacket, especially since I have two little boys of my own! A gorgeous jacket! Smart and simple - perfect for any little boy. Mine would love it. I love this jacket, and so do both my boys!! Love the jacket! I would love to be in the running for this cute jacket. Oh, how I LOVE this pattern! Oh Another one screaming PICK ME!! :D I have blogged the new pattern as well, giving me 2 chances of you PICKING ME! LOL! Extra entry please...left a post on my blog. Oh! It looks awesome! I love the Downtown Girl and this one is perfect for boys! That would look adorable on my little dude! I'd love to win the pattern. Oh, and I've also mentioned your giveaway on my blog: bkmcdermott.blogspot.com. Thanks! Love it! Its nice to see a stylish pattern to make for a little boy. I would love to have this pattern!! I will love this pattern. I have 2 boys and have made your lazy day hat patterns for them. Currently busying myself with dresses for the neighbor girls. Save me!!! love the jacket, yet another great pattern. Two of my litle ones are boys, and I would love to make them cute little jackets! I've made my older son a jacket when he was two. He loved it so much he wouldn't let the Sunday school teachers take it off of him! He was sweating by the time I picked him up!!! He's four now, and he still appreciates it when I make something for him. Oh yes please - count me in. It looks great I have though about playing with the girl pattern to make it more boy like - but now I dont have to as you have done it for me - THANKYOU. I love this pattern and have already bought your Uptown Girl pattern. Would love to be in the giveaway please. I will leave a message on my blog as well. What an adorable jacket. I have three girls and one little boy. I am always making my girls skirts, dresses, etc. but have never made my little guy anything. He would love the jacket! Another funky and cool creation by you. well done. And a boy thing- so much harder to find than girl things I reckon! I will also blog about this giveaway....Double the chances of winning!!!!!!!!!!!!!!!! Great new pattern. Will would look spinky in one of these little numbers. Oh and I will add a link on our family blog. So does that mean I get two chances!!!! I need all the chances I can get! That is such a cute jacket. It's so nice to see someone doing patterns for boys! This pattern is gorgeous and i would love to make this for my beautiful nephews!! Thanks for the giveaway! Ooohhh so excited to have the opportunity to win this pattern, it's gorgeous. Love your patterns. Would love to win a copy of this one!! Lovely design! I have a little man here who would love that pattern! I've mentioned it in my blog too. Very cute little jacket, I have two boys that it would suit perfectly! thankyou for the opportunity of entering! That is a gorgeous styled Boys Jacket. If I don't win I will just have to hound my husband to let me buy the pattern lol. My 2 boys would love it and my nephews too. I have also blogged about the comp (sent my comment a minute ago lol). I've blogged about your giveaway too! 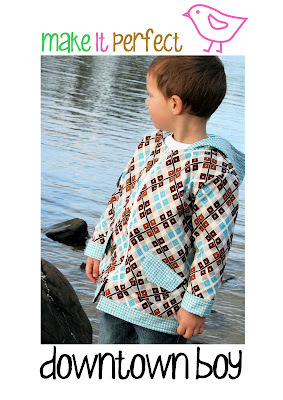 I heard about the giveaway on Bianca's blog and would love to make the jacket for my son. It's not often you find cool patterns for boys (he would love it too since I pretty much make everything for his sister). Love the uptown girl jacket pattern too. thursday is my lucky day- hope I win!!! I love your designs and truly admire how talented you are! The Downtown Boy Jacket would look great on my little boy... count me in!!! Great designs! I would love to have this pattern. I also plan on getting the uptown girl pattern from you soon! You are very talented. Great pattern. Please count me in. I have blogged about it too! I have made your uptown girl jacket for my little girl & it was so simple to run up - it turned out perfectly. And its just SOOOOOOO gorgeous! Whilst making it, my son actually asked me to make him one too - so I got to thinking about how I could make the pattern less feminine. But you've done the job for me! I would love to win this for my little man and make him the jacket he's been asking for. Thanks for all your hard work - you sure do have your hands full! I'd love a chance to win that pattern. Count me in! Would love to win this, so very very cute! Once again Tones, you've done an amazing job! Sooo Cute !! My little guy would look great in it!! Am I too late? I'd love to win it. i want it more than a fat kid wants candy.